Le Pain Quotidien – allegedly translating to 'daily bread' serves a whole range of food. They offer a huge range of meals to choose from as well as freshly baked breads and patisserie. 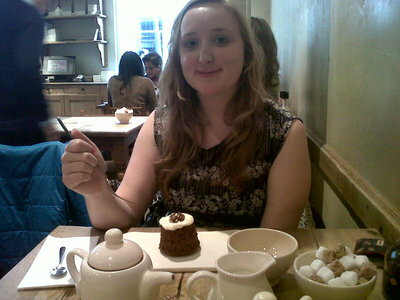 I particularly enjoyed the presentation of something as simple as what I had - a pot of tea and a carrot cake. 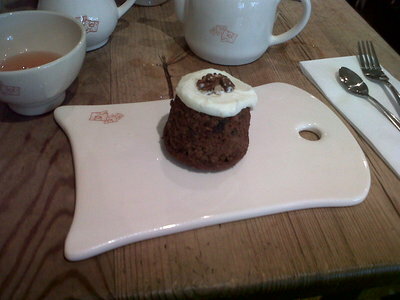 You can see the picture of how the carrot cake was served as well as the almost bowl shape of the teacup. A small novelty, I know, but I do love places that have that extra something about them. Le Pain Quotidien are known for their organic products as they strive to provide ingredients that are of the highest quality as well as doing their part for the earth. Even the furniture and construction is energy efficient and environmentally friendly. This seems to be a rarity in businesses today. As well as this, all pastries are baked freshly each day – something else that is rare to see. Le Pain Quotidien seems to pride itself on their extraordinary taste and accomplishing the perfect cake. As I have previously worked in a tearoom, I can appreciate the difficulty involved in making such good tasting food so I can completely give my thumbs up to Le Pain Quotidien on their divine tasting cakes. The presentation of all of them in the restaurant was extraordinary and was extremely hard to choose which one I wanted. I am glad that I settled for a carrot cake as I was not disappointed. Another thing I found fascinating was the idea of having a communal table. This appears to be their way of creating a sense of community by allowing friends and/or strangers to sit around the table, enjoying one another's company. I thought that this seemed an interesting thing to do but I am aware a lot of people do not enjoy sitting with people they do not know – if that is you, then this is not a feature for you. However, you could still break bread at another table in peace. When my friend and I visited the restaurant we did not book a table. However, you are able to do so if you wish to make sure you can secure a table. There are around 21 restaurants in and around London as well as locations internationally. 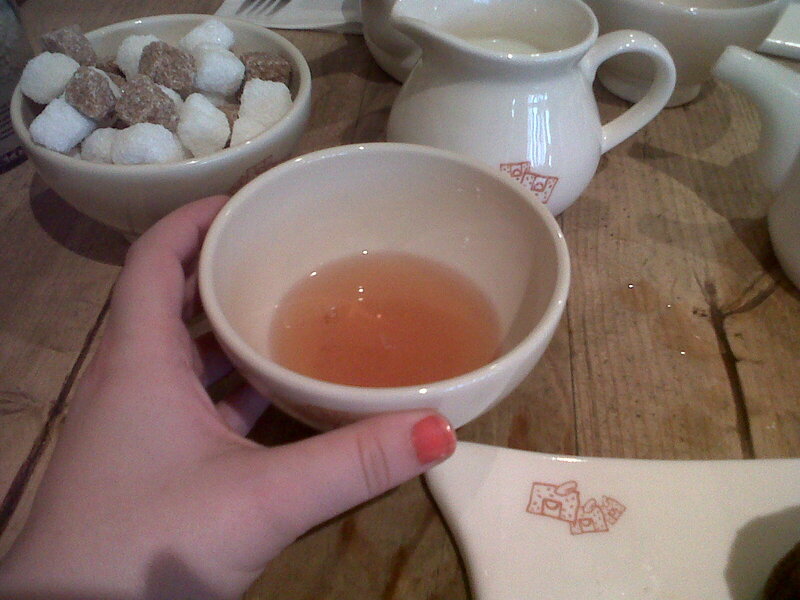 I do recommend you experience Le Pain Quotidien if you enjoy organic, freshly baked and extremely delicious food. I am hoping to try more on their menu next time I visit so you should try to stop in for lunch or dinner if possible. Don't forget to try a delicious pastry though; they really are to die for. For more information you can visit their website. Why? It's freshly baked, organic and delicious. Do you need another reason? Great article, Sally-Jane. Love the photos. Next time I drop by a Le Pain Quotidien in my neighborhood, I've got to try the carrot cake, too. Thanks for sharing.